Missed a class? Check below to see if a kit or sample is available. HAUNTING makes Halloween scary and fun all at the same time. Graphic 45 created a paper that captures the spooky elements of Halloween in a fun and imaginative way. 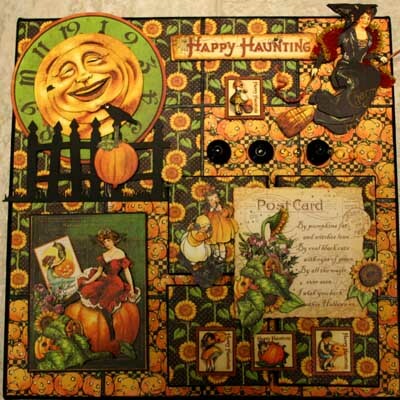 We will be using the new g45 Happy Haunting collection of paper to create a fun canvas with LOTS of layered images. Supplies to bring are: Complete Basic Artist Stamp Kit, paper trimmer, sharp detail scissors for cutting layered images, foam tape, thick tacky glue, clear silicone caulk, Diamond Glaze, matte ModPodge, a brown ink pad for inking paper edges, and black or brown medium tip markers to ink the small cut paper images. There are no extra kits available for sale.